When it comes to sales rank, every Amazon seller has their own idea of what a “good” sales rank is. For me, I’ll almost always buy a toy that is consistently ranked under 150,000. I’ll even buy a toy that is ranked much higher, as long as the number of competing sellers is low and the ROI of the toy is high. But a toy ranked over 1 million? What reseller in their right mind would buy a toy ranked over 1 million? Well… me. Do I buy up all toys ranked over 1 million? No, I don’t. Sales rank is just one part of the decision process I go through to when I’m making my buying decisions. I’ll blog soon about my own personal checklist when it comes to buying decisions. As you spend more time selling on Amazon, you begin to realize that sales rank is just a number that signifies how recently a particular item has sold. A toy with a really low sales rank (1-1000) sells possibly many times per day, whereas a toy with a higher sales rank could possibly only sell once a week, once a month, or even once a year. A low sales rank does not ever guarantee that a particular item will sell. It only states how recently and often an item has sold. About a month ago, I was walking through a local Goodwill store when I came across an electronic “Are You Smarter Than a 5th Gra der?” handheld game. It was still brand new in its original packaging. Goodwill was asking $2.00, so I picked it up and scanned it. The information that was returned to me told me that this toy was ranked over 1.2 million, and had no current sellers. 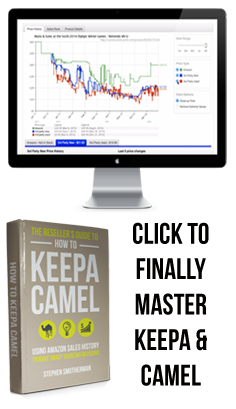 I checked Keepa and it did not have any pricing or sales rank history. Many times, I would have put this toy back on the shelves and kept on sourcing, but I just couldn’t let it go. I knew that “Are You Smarter Than a 5th Grader?” was a popular game. 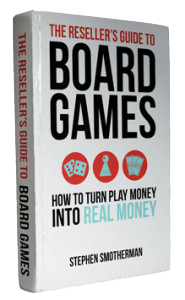 I had sold a few of the board game versions in the past with great success. I didn’t know that they made an electronic handheld version. I had also had some success with selling electronic handheld games, but that didn’t mean that this game would be guaranteed to sell fast. I started to think… Since this game had no current sellers, it’s possible that the rank was so high because it had been so long since it was even available to be sold on Amazon. The longer an item has no sellers, the faster its sales rank will rise, until, at one point, the sales rank might disappear all together. I decided to investigate how well this toy was doing on other selling platforms. I opened up the eBay app on my phone and decided to check out the most recent completed auctions. There is a search feature on the eBay app that lets you look at the most recent completed auctions. 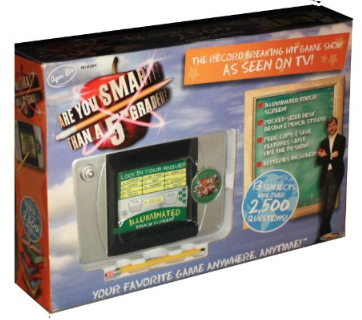 I was happy to see that the “Are You Smarter Than a 5th Grader?” handheld electronic game was selling a few times a month on eBay. When I saw the success that some eBay sellers were having selling this game, I decided it was worth buying. The completed eBay sales also told me that buyers were spending around $10.00 to $15.00 (shipping included) for this toy. I decided to buy the toy and list it on Amazon for $19.99. This was more than eBay sellers were selling it for, but I had a plan. If it didn’t sell within a few months, I’d start to lower the price a little. I bought this item from Goodwill for $2.00 on May 25th. Two days later, it was on it’s way to an Amazon FBA warehouse. I’m happy to inform you that yesterday, this toy sold at my $19.99 sales price. Now, I’m wondering if I should have priced it even higher. In any case, I turned a $2.00 investment into a $20 sale. I’ll take that any day, and all it took was one minute researching the eBay app to see how it was selling on that platform. 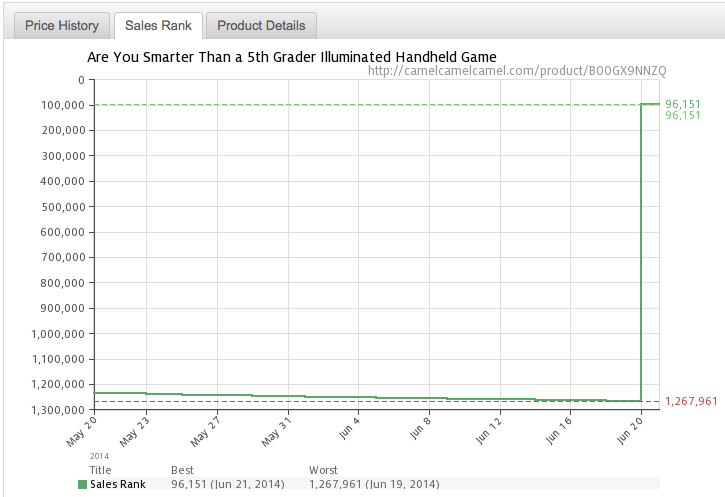 Update: As of yesterday, the sales rank for the “Are You Smarter Than a 5th Grader” electronic handheld game jumped from 1,267,961 all the way to 96,151. 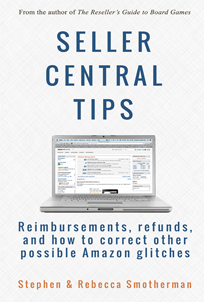 Note: If you want a FREE PDF download of the latest Amazon Category Sales Rank, all you gotta do is click here. So what about you? What other things do you think about when you making your buying decisions? Have you ever taken a gamble with an item ranked super high? How did it turn out for you? I’m here to tell you it doesn’t have to be that way! You can finally get the clarity you need on the issue of understanding Amazon sales rank numbers. We at Full-Time FBA have launched a mini-course called The Reseller’s Guide to Sales Rank: Understanding Amazon Best Sellers Rank for Maximum Profits. The mini-course is a combination ebook (30+ pages) and video course (almost 2 hours). 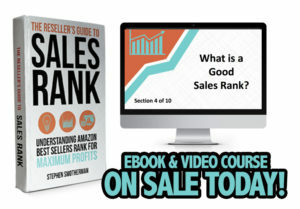 Check out The Reseller’s Guide to Sales Rank mini-course to see how you can master the concept of best sellers rank and be on your way toward smarter sourcing decisions for your Amazon FBA business! Good suggestion. I never really thought of referring to eBay when I run into these common indecisions. Fortunately, my Asellertool app, FBA Scan (which is oddly overlooked by most sellers in our FBA Facebook groups), has a great new update with a convenient eBay link. Thanks again for the tip. You’re welcome, Gene! I have not looked into Asellertool or their app. I plan on checking them out sometime soon. Thanks for the suggestion. Thank you for your post and telling us your process. i can’t imagine you ended up with much more than $10 after all of amazon’s fees. For me ROI is nice but if the actual dollar amount is that low, i better be buying a lot of them, otherwise it’s too much work. i have at least one category where the price point is high enough that only a few sell a month. So a lot of times, some of them go to N/A ( no sales rank). The thing about doing this over time is that hopefully you begin to recognize these items and have access to getting them more than once. That’s the sweet spot. Being able to replenish. And as you mentioned, one sale can take an item from no sales rank to under 100,000. John, I love the fast selling, easily replenish able items too. They’re my great and butter, but for me, it’s also good to have a well rounded inventory with some long tail items that will sell every now and then. With Amazon’s inventory storage fees so low, it’s worth it to me to buy some of the longer tail, and even lower ROI items that sell every so often. Once you get a lot of items that sell every now and then, it starts to look like they’re selling all the time, since there are so many. Great post Stephen, I’ve been noticing the same thing recently. Some items are just priced to high on Amazon which is what’s causing the surge in rank. In the past I’ve passed on items with 500,000+ rank because I didn’t want to wait for the sale. In some case the items were $50+ items that could be bought for $5-$10. Now that I’m using eBays sold listings info I’m seeing that $5-$10 purchase can be flipped a lot of times for $20-$40 on eBay or for even more on Amazon. Yes, Brian, good points! I often look at the CCC price history and I notice that a many items have such high ranks, only because the sellers have the price way too high. I look back at the prices when the item was actually selling, and price it competitively around that price point. Oh, and I love finding items on eBay to flip on Amazon. That’s a lot of fun! I love long tail products as much as I love the “fast flips.” My business model is focused around having a good balance of both (and everything in between). Great link, too, Jordan. Thanks for sharing. I’m a huge fan of Goodwill and mercy… the profit margins are just ridiculous when I find something. I’m more than happy to take the minimal risk of purchasing something for a buck or two and let it sit as long as it needs to knowing eventually I’ll make many times my investment. I love thrift store ROIs! Hi Stephen, that was a great overview of how the sales ranks work…I’ve often been mystified about how some of my products can swing so much within just a few days…now it makes sense! I’m with @John William Johnson, though, it seems like so much work of one item added to your inventory. I guess I’m a lazy sourcer! I am working on abandoning retail sourcing and moving into selling my own products. I am testing my first product and so far, it’s selling better than anything I’ve sourced elsewhere. Still not raking in the profits, but hopefully that will come! For me, at first… it seemed like a lot of work for one item… but now, I’m so used to it, and it’s a vital part of making smart sourcing decisions. I always hear people say, “You make your money when you buy.” and this method helps me make more money. Really, it only adds a few seconds once you get used to it, and the amount of money you make (or avoid losing) on making smarter sourcing decisions is well worth those precious seconds. Great practical info. It’s great to here everyone’s buying styles. This is something I will add to mine. Thx Stephen! I see that you love buying items on eBay to sell on Amazon, but isn’t that risky in the event that Amazon requests receipts? Since eBay and/or eBay sellers are not usually authorized distributors, as a department store would be. I recently stopped buying on eBay to resell on Amazon for that reason; am I wrong to be worried? I’m not worried because I’m not going deep on these items. I’d only be worried if I had many in stock and amazon asked for receipts in order to keep selling them.